Associating breadcrumb component to the RadTreeView. Using the RadTreeView designer to add and configure nodes. Programmatically adding and configuring nodes. On the form add a RadBreadCrumb and RadTreeView. In the Properties window for the RadBreadCrumb set the DefaultTreeView property to point to the RadTreeView. The design should now look like this. Drop the TelerikMetro theme form the tool box and set all controls ThemeName property to TelerikMetro. Right click the RadTreeView and select Open Property Builder from the context menu. You will see a set of buttons on the left side of the RadTreeView Property Builder and a preview of the tree view below the buttons. See Property Builder topic for a complete tour of functionality. Click the far left button (a green "Plus" button that adds nodes) three times to add three nodes. 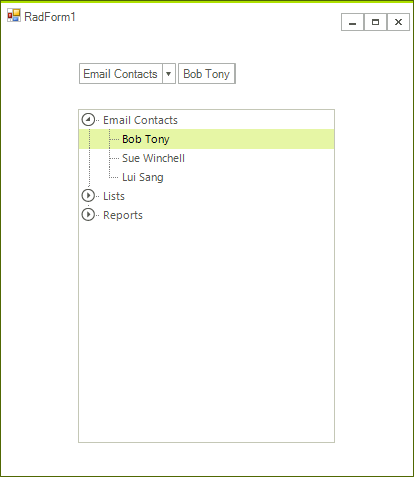 Click the first node and enter "Email Contacts" in the Text entry. 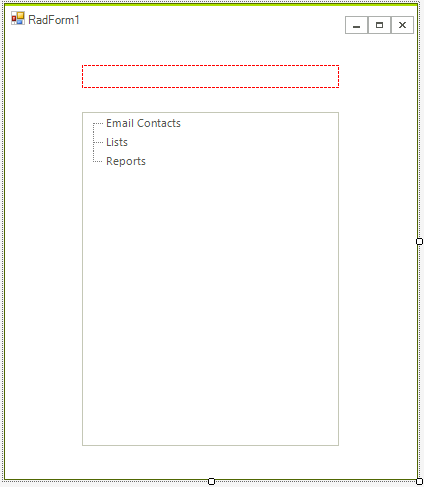 Click the second node and enter "Lists" in the Text entry. Click the third node and enter "Reports" in the Text entry. Click the RadTreeView Properties tab located in the left part of the Window. 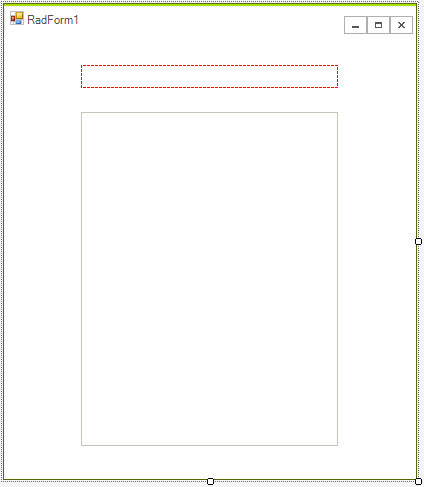 Click OK to close the Property Builder.The design should now look like the screenshot below. In the form's constructor add the code appearing below the InitializeComponent() method call. This code creates new RadTreeNode objects, populates them with text and attaches them to parent nodes.